Marketers are working hard to convince you to buy their products in the home stretch of this Holiday shopping season. While working hard is important, working smart is more effective. To work smart, marketers need to better understand how to create more effective marketing content. Those that dive more deeply into what creates better content discover that they have been operating under some serious misconceptions. One of the most common misconceptions is that people will not pay attention to ads or communications that have more than a minimal amount of ad copy. When asked, marketers (and the buying public) overwhelmingly believe that short copy sells better than long. Measured results tell a different story. Do not like to read. Are in the habit of reading short messages in texts. Are too distracted with multiple media channels. While these reasons are often true, the conclusion that short copy sells better is not. Good marketers know that only members of the target audience can decide what is "too long" and what is "too short." When I saw the movie Titanic, it was over 3 hours long. I thought it was too long. Teenage girls thought it was too short and watched the movie over and over again. Leonardo DiCaprio was not on the screen enough for them. If people are really interested in something, they want more. If they are not interested, they want less. You cannot have too much of a good thing, but any amount of a bad thing is too much. One of my favorite T-shirt's of all time has a picture of Albert Einstein on it with a headline that reads, "Sit with a pretty girl for an hour, and it seems like a minute. Sit on a hot stove for a minute and it seems like an hour. 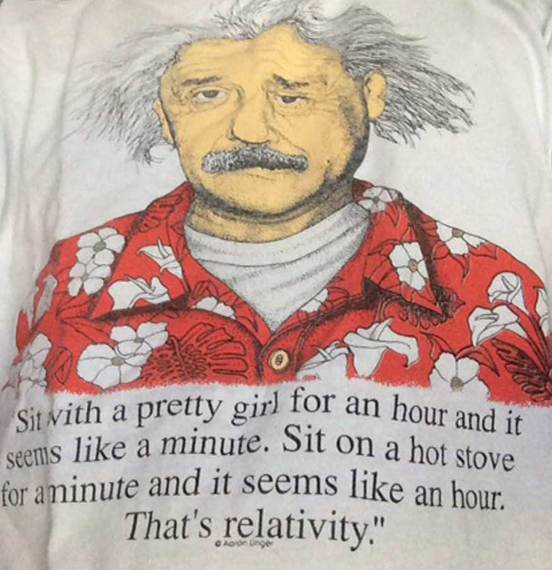 That's relativity." Of course, if the content creator can get the essential information into the consumer's head with less copy, that is usually a good thing because it saves the consumer's time - a clear benefit since most of us are either busy or lazy. However, it is nearly impossible to pick out who in the target audience wants more and who wants less. What is a good marketer to do? The answer is format the information into "bite-sized" pieces using sub-headlines and graphic elements. For those who want less, they can read the headline, look at the photo, perhaps read the subheads and then skip to where they can buy it. For those who want more, the longer body text can provide that too. Yes, less can be more, but the way marketers should look at this is well-written long copy is usually a far more concise version of text that would otherwise be a lot longer. Most importantly, good marketers format it in a way to allow "busy or lazy" consumers to pick out the main benefits without reading, viewing, or listening to the entire content. There are many more quotes from many more experts, but in deference to my previous post on the power of three, I will stop here. I know what some of you are thinking. The people I quoted above are "old guys" who are long gone. What they said is no longer relevant in our fast-paced, distracted, short-attention-span world. While those "in the know" understand that the wisdom of these "old guys" is more powerful today than ever, I need to address this objection head on. The fact is that data shows that long copy typically sells better than short copy online too. Marketing Experiments did a series of tests for clients to show the effect of copy length on Website conversion rates. In their tests, the long copy outperformed the short copy by wide margins. Need more proof? On the Conversion Rate Experts Web site, they share how they were able to boost Crazy Egg's conversion rate by 363%. Can you guess how they did it? They made the home page 20 times longer!
. Longer copy enables the advertiser to... Provide more benefits, which in turn, shows more people how the product or company can help them. Target the customer better so those who respond are more likely to buy. Give those who want more information the information they need so they will be more comfortable buying your product or doing business with your company. Give those who are "busy or lazy" and don't want to read a lot the ability to skim the important points without requiring them to read, listen to, or watch it all. This requires good formatting. Provide more keyword-rich copy to boost organic search engine results. Hopefully, this post will help you convince the skeptical throngs who still believe that shorter copy sells better. Since it is a counter-intuitive notion, you need proof to support you.